This article originally appeared in RS 1107 from June 24, 2010. 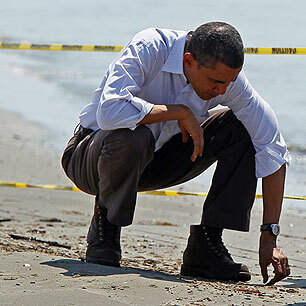 (Rolling Stone Magazine) — On May 27th, more than a month into the worst environmental disaster in U.S. history, Barack Obama strode to the podium in the East Room of the White House. For weeks, the administration had been insisting that BP alone was to blame for the catastrophic oil spill in the Gulf – and the ongoing failure to stop the massive leak. “They have the technical expertise to plug the hole,” White House spokesman Robert Gibbs had said only six days earlier. “It is their responsibility.” The president, Gibbs added, lacked the authority to play anything more than a supervisory role – a curious line of argument from an administration that has reserved the right to assassinate American citizens abroad and has nationalized much of the auto industry. “If BP is not accomplishing the task, can you just federalize it?” a reporter asked. “No,” Gibbs replied. 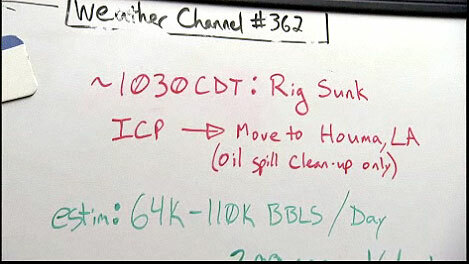 Hours after BP’s rig sank on April 22nd, a white board in NOAA’s “war room” in Seattle displays the administration’s initial, worst-case estimate of the spill — 64,000 to 110,000 barrels a day. Meet Obama’s sheriff, Ken Salazar. Meet the Environmental Protection Agency’s most progressive leader ever, Lisa Jackson. Get your daily dose of political muckraking from Matt Taibbi on the Taibblog. Tim Dickinson blogs about all the news that fits, from the Beltway and beyond on the National Affairs blog. do you hear yourself? “Obama FAILED to crack down the corruption of the Bush years”? Why not blame that and this BP bullshyt on where it goes? BUSH and BP! I swear you people go to great lengths to have something negative on Obama. Even if it DOES sound stupid!